Snow Bird was under the command of Commander Jack Reed Hunt, U.S.N.R., a fifteen-year veteran of airship operations. There were two additional pilots, Commander Ronald W. Hoel, U.S.N., and Lieutenant Commander Robert S. Bowser, U.S.N. The crew also consisted of three navigators, Lieutenant Stanley W. Dunton, Lieutenant Charles J. Eadie, and Lieutenant John R. Fitzpatrick. The remainder of the crew were Chief Aviation Electronicsman (ALC) Lee N. Steffan, crew chief and radio; Aviation Machinist’s Mate 1st Class (AD1) Thomas L. Cox, flight mechanic; Aviation Electricians’s Mate 1st Class (AE1) Carl W. Meyer, electrician; Aerographer’s Mate 1st Class (AG1) William S.Dehn, Jr., aerologist and photographer; Aviation Machinist’s Mate 2nd Class (AD2) James R. Burkett, Jr., flight mechanic; Aviation Metalsmith 2nd Class (AM2) George A. Locklear, rigger and cook; and Aviation Electrician’s Mate 2nd Class (AT2) Frank J. Maxymillian, radio. Also on board the air ship was a civilian flight engineer, Mr. Edgar L Moore, a Goodyear Aircraft Corporation Field Representative. Snow Bird headed east across the Atlantic Ocean, passing north of the Azores on 7 March. At this point, the airship had burned off enough fuel that it was light enough to cruise on one engine. This allowed a much greater range. (A lateral rive shaft between engines allowed both propellers to continue turning.) Late in the third day the flight, the blimp reached the west coast of Portugal, having completed the first Atlantic crossing by a lighter-than-air craft in 12 years. Snow Bird turned south, heading for Casablanca on the west coast of North Africa, which it reached the morning of 8 March. The airship continued south along the African coast before turning west to re-cross the ocean. 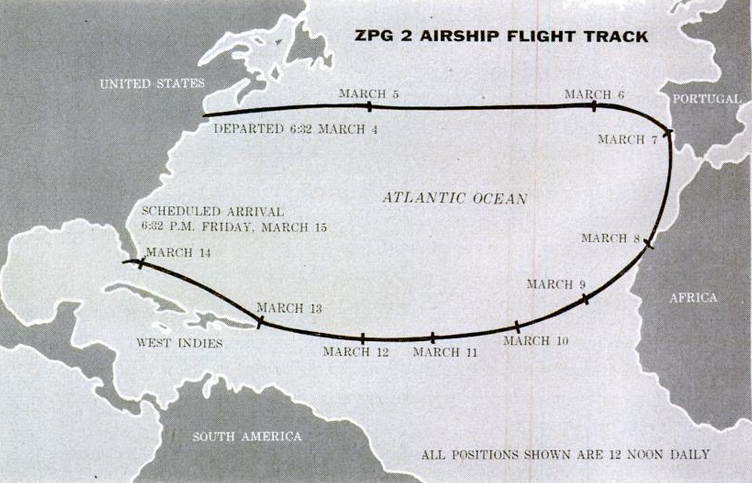 The route took the blimp past the Canary and Cape Verde Islands, and then onward to the Virgin Islands. Arriving back in the United States, Snow Bird made landfall at Miami Beach on the afternoon of 14 March. Not finished with its voyage, the airship next headed to Dry Tortugas at the far western end of the Florida Keys, and then finally landed at NAS Key West, Florida, on 15 March. Snow Bird had traveled 9,448 miles (15,205 kilometers) without landing or refueling. 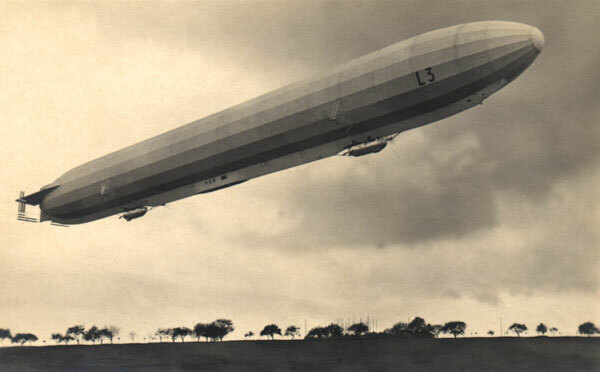 The Fédération Aéronautique Internationale (FAI) lists this as “the longest recorded airship flight.” This exceeded the distance record set by Graf Zeppelin, flying from Friedrichshaven, Germany, to Tokyo, Japan, (11,247 kilometers) 15–19 August 1929. From takeoff at NAS South Weymouth to landing at NAS Key West, the total duration of the flight was 264 hours, 14 minutes. The crew was met by a large group of dignitaries. Commander Reed was presented the Distinguished Flying Cross by Fleet Admiral William Frederick Halsey, Jr., United States Navy, one of the greatest military leaders of World War II. 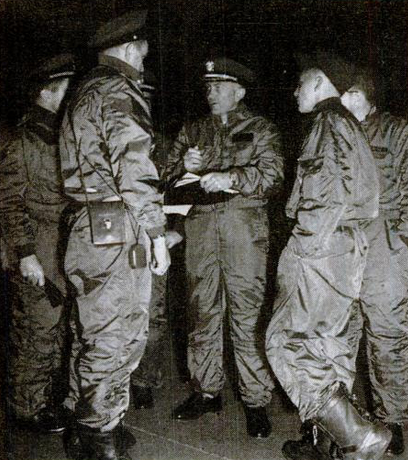 Commander Hunt was later presented the Harmon International Trophy by President Dwight D. Eisenhower. Goodyear ZPG-2 Bu. No. 141561 was built by the Goodyear Aircraft Corporation at Akron, Ohio. It was the 11th of 12 “N-class” airships which were used for patrol, anti-submarine warfare ASW), and when equipped with radar, for airborne early warning (AEW). The ZPG-2 is 343 feet (105 meters) long and the envelope has a maximum diameter of 76 feet (23 meters). A two-deck control car was suspended beneath the envelope. 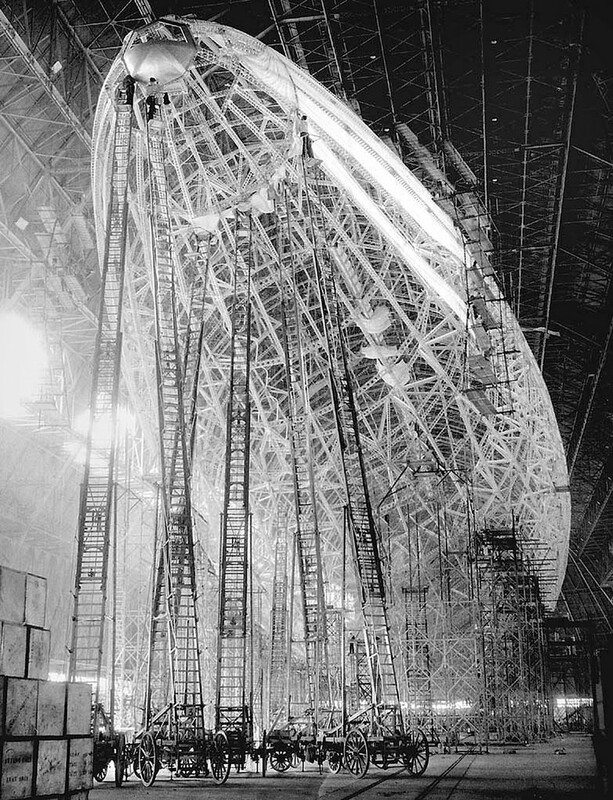 The airship had an overall height of 107 feet (33 meters). Bouyancy was provided by 1,011,000 cubic feet (28,628 cubic meters) of Helium. There are four fins placed in a X-pattern at the tail of the ZPG-2, called ruddervators. (These were similar to the fins used on the experimental submarine USS Albacore (AGSS-569) several years later.) 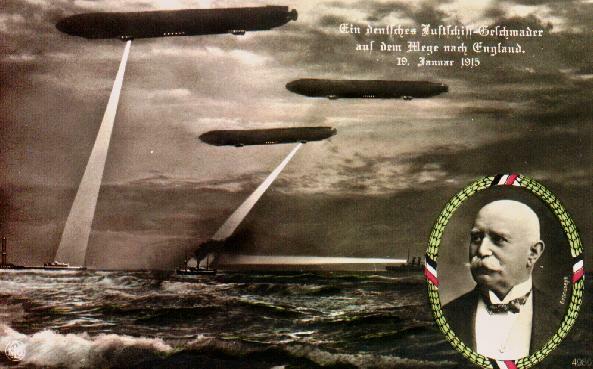 The ruddervators allowed the airship to be controlled by a single control column, a change from the two controls used previously. Also, the decreased vertical span of the fins allowed greater ground clearance, so that the blimp could takeoff at steeper angles than if it had been equipped with the standard cruciform fins. 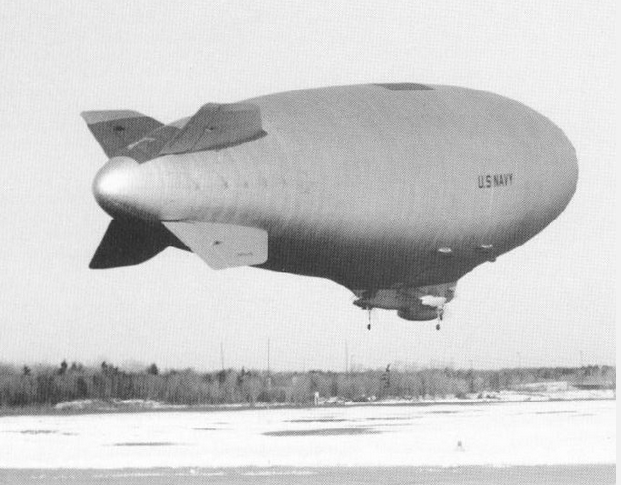 N-class blimp N-1. Compare its fins to those of the airship in the background. 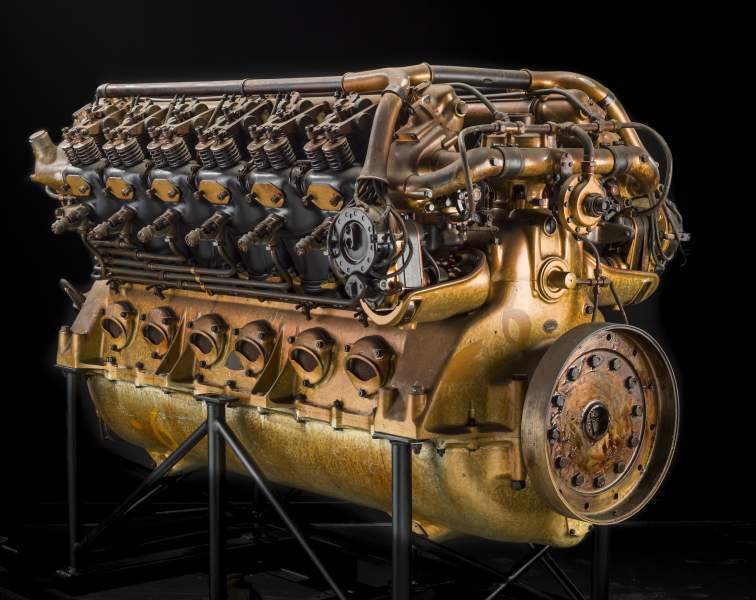 The Goodyear ZPG-2 was powered by two air-cooled, supercharged, 1,301.868 cubic inch displacement (21.334 liter) Wright Aeronautical Division R-1300-2 (Cyclone 7 865C7BA1) seven-cylinder radial engines mounted outside the control car. The R-1300-2 was a direct-drive engine with a compression ratio of 6.2:1. It was rated at 700 horsepower at 2,400 r.p.m., and 800 horsepower at 2,600 r.p.m., for takeoff, using 91/96 octane aviation gasoline. The engines turned three-bladed Curtiss Electric variable pitch, reversible propellers. The R-1300-2 was 48.12 inches (1.222 meters) long, 50.45 inches (1.281 meters) in diameter, and weighed 1,067 pounds (484 kilograms). The ZPG-2 had a cruise speed of 57 miles per hour (92 kilometers per hour) and maximum speed of 80 miles per hour (129 kilometers per hour). Its normal endurance was three days. Bu. No. 141561’s cockpit, nose cone and a frame of a ruddervator are displayed at the National Naval Aviation Museum, NAS Pensacola, Florida. Jack Reed Hunt was born at Red Oak, Iowa, 18 May 1918. He was the second of seven children of Smith Reed Hunt, a baker, and Blanche Luise Seefeldt Hunt. The family moved to southern California, where Jack grew up. Jack R. Hunt joint the United States Navy on 4 April 1942. 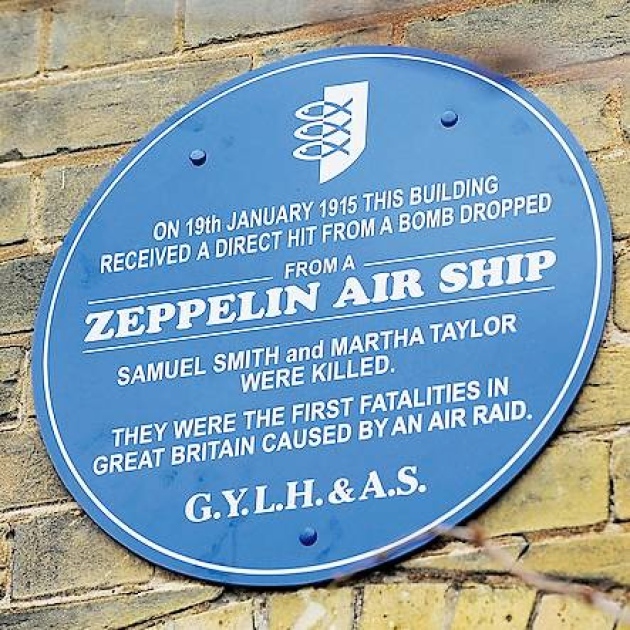 He was trained as an airship pilot and flight instructor. Hunt was commissioned as an Ensign in the United States Naval Reserve, 1 October 1942, and promoted to Lieutenant (junior grade), 1 October 1943. Hunt remained in the Navy following World War II. He was promoted to Lieutenant Commander 1 August 1951, and to Commander, 1 July 1956. 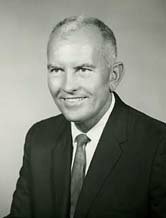 From 1963 until 1984, Jack Hunt was the president of Embry-Riddle Aeronautical University, a fully-accredited aerospace university. Hunt was married three times (Bethel, Donna and Lynne) and had seven children. He died 7 January 1984, at the age of 65 years. 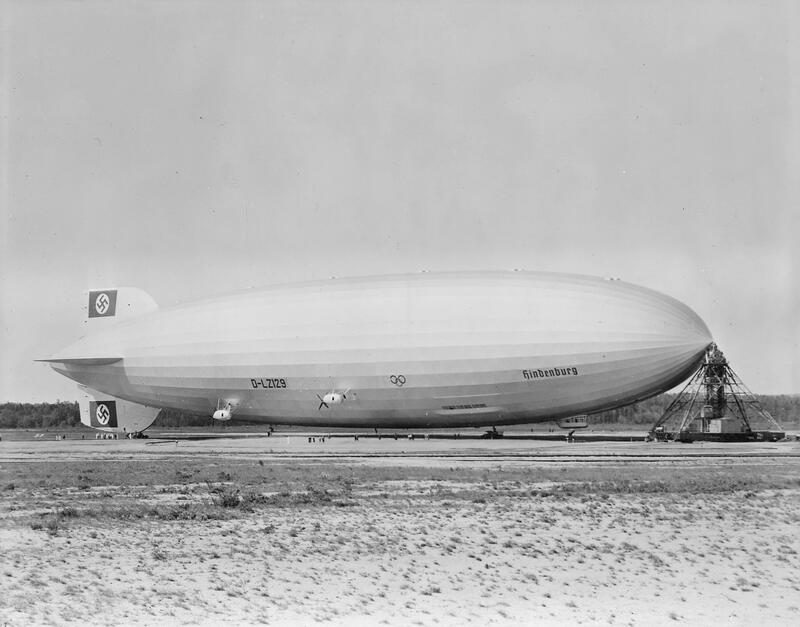 12 February 1935: The United States Navy rigid airship USS Macon (ZRS-5), under the command of Lieutenant Commander Herbert Victor Wiley, crashed into the Pacific Ocean off Monterey Bay, on the central California coastline. 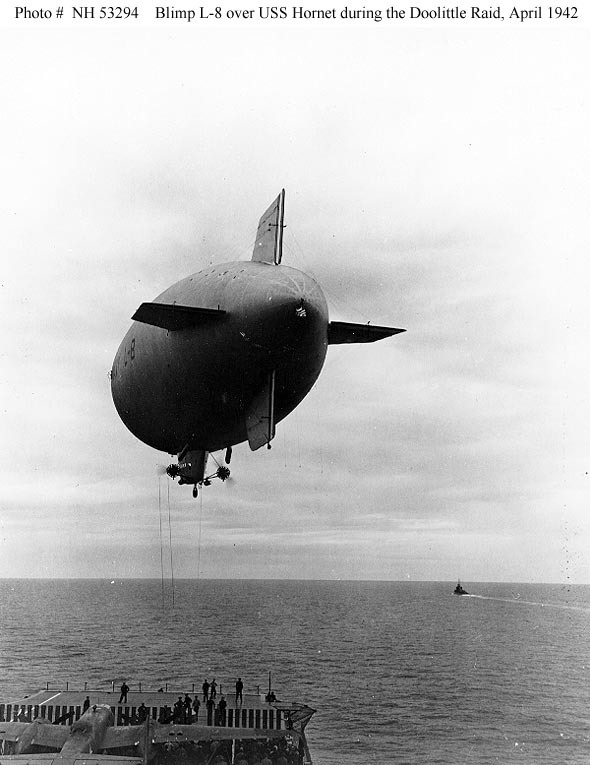 The airship soon sank to the sea floor, approximately 1,500 feet (457 meters) below. 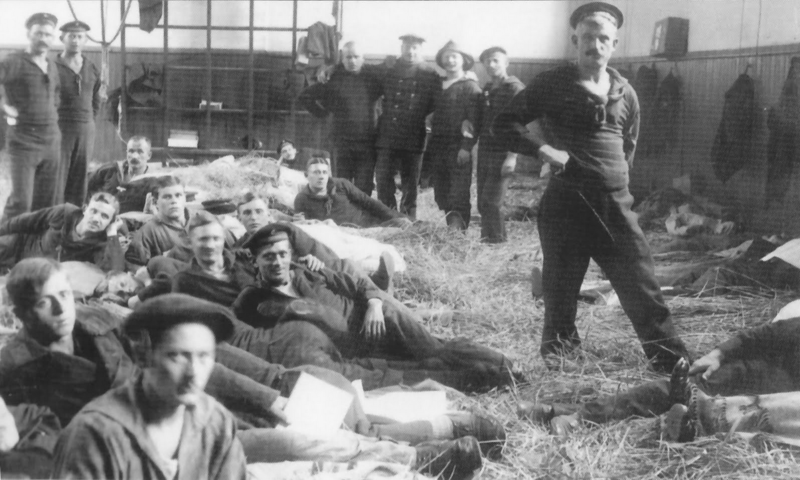 Of the crew of 76 men, 74 survived. 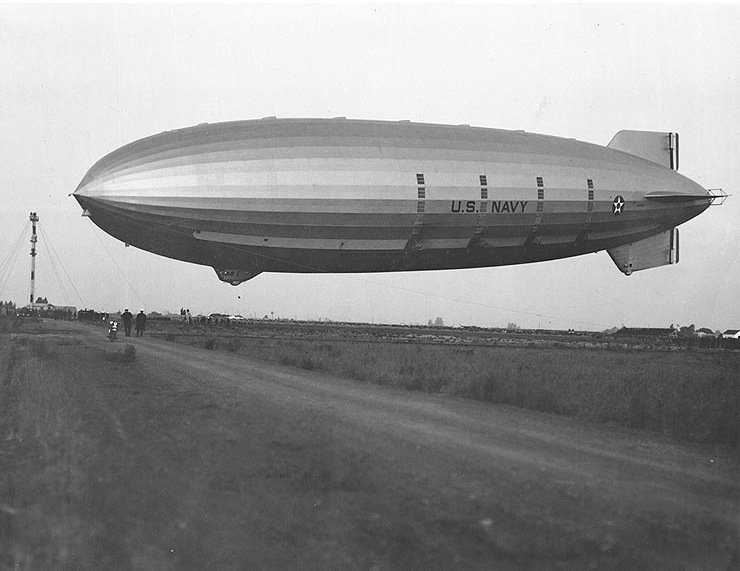 During an earlier transcontinental flight, USS Macon had encountered severe turbulence while crossing mountains in Arizona. A diagonal girder in one of the ring frames failed. Temporary repairs were made, but permanent repairs were deferred until the next scheduled overhaul. On 12 February 1935, the airship flew into a storm near Point Sur, California. The ring frame failed and the upper vertical fin was lost. Pieces of broken girders punctured several of the aft helium cells. With the loss of helium, Macon lost rear buoyancy and began to settle. 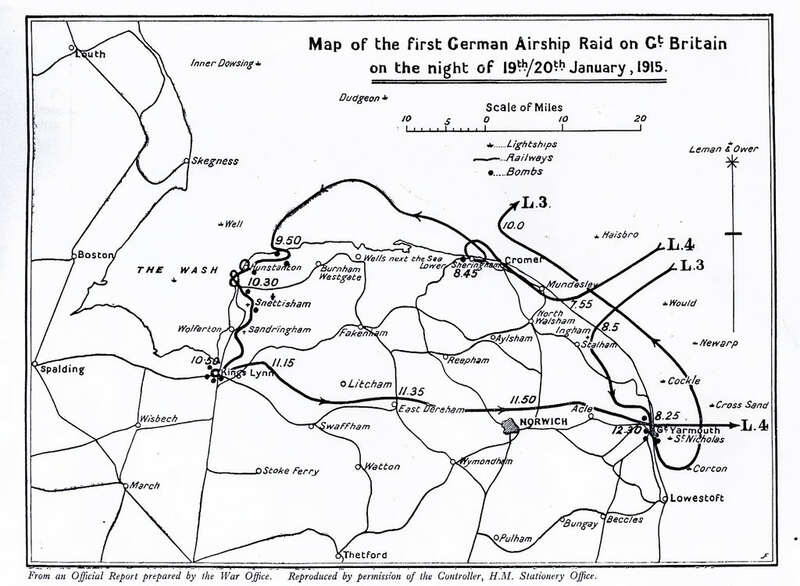 To compensate, all engines were run at full power and ballast was released. The airship began to climb with a nose-up pitch angle. When it passed 2,800 feet (853.4 meters) altitude, it reached its Pressure Altitude Limit (“Pressure Height”). At this point, expanding helium began to vent from the gas cells. 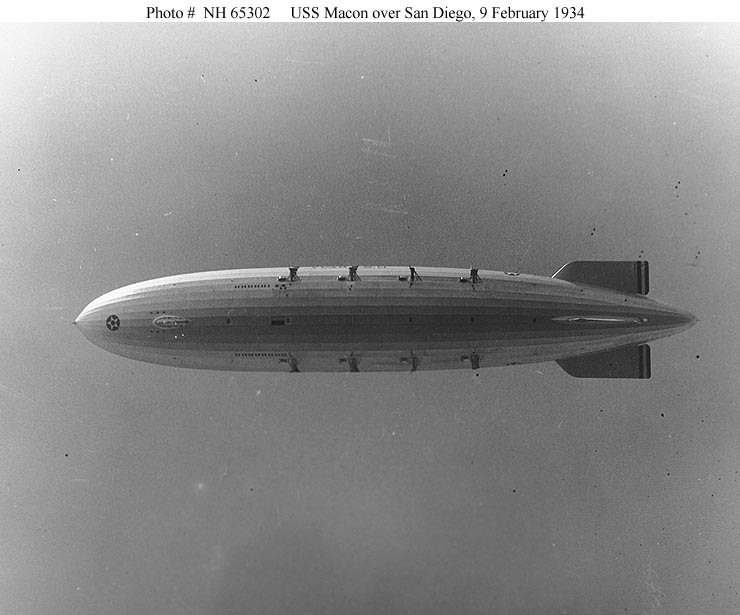 Macon continued rising until reaching 4,850 feet (1,478.3 meters), by which time it had lost so much helium that the engines could no longer keep it airborne and it again began to settle toward the ocean’s surface. The descent took twenty minutes. One sailor jumped from the airship, but did not survive the fall. Another swam back to the sinking ship to collect personal belongings and drowned. 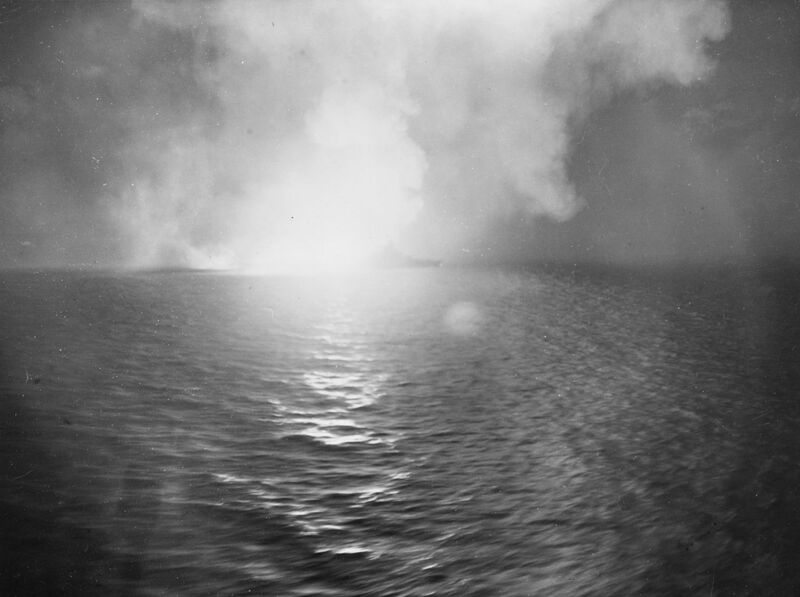 Survivors were rescued by three U.S. Navy Omaha-class light cruisers, USS Cincinnati (CL-6), USS Richmond (CL-9), and USS Concord (CL-10), which had responded to Macon‘s distress signal. Lieutenant Commander Wiley was commended by Claude A. Swandon, Secretary of the Navy, for his handling of the accident, and he was awarded the Navy and Marine Corps Medal for personally rescuing a member of the crew at the risk of his own life. 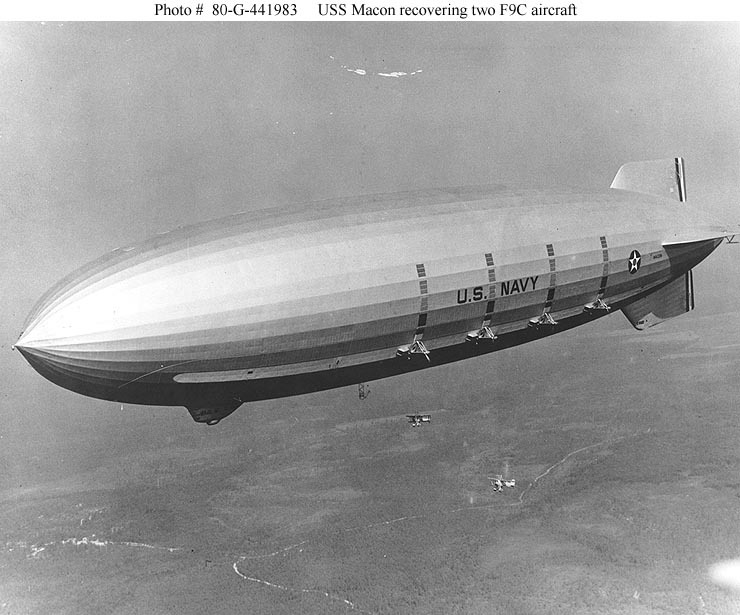 USS Macon was the U.S. Navy’s last rigid airship. 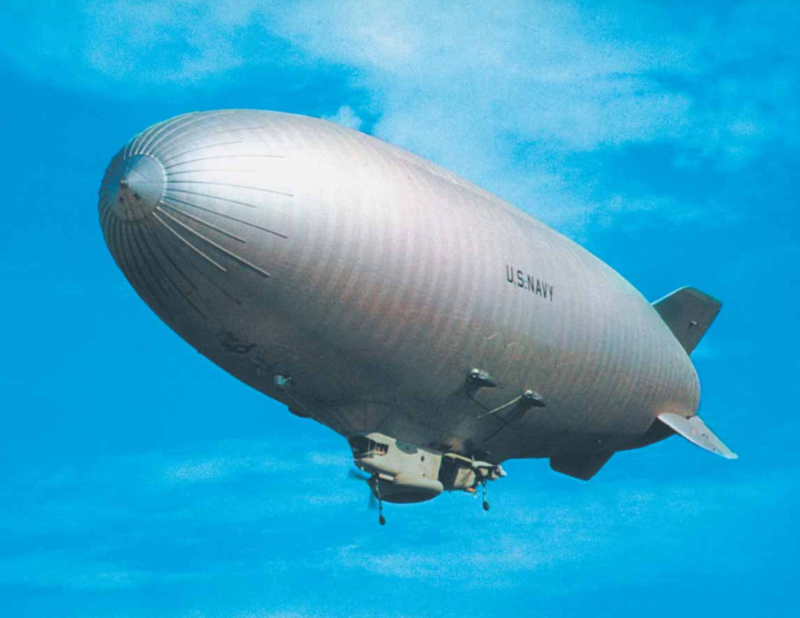 For the next twenty years, all lighter-than-air craft were non-rigid “blimps”. 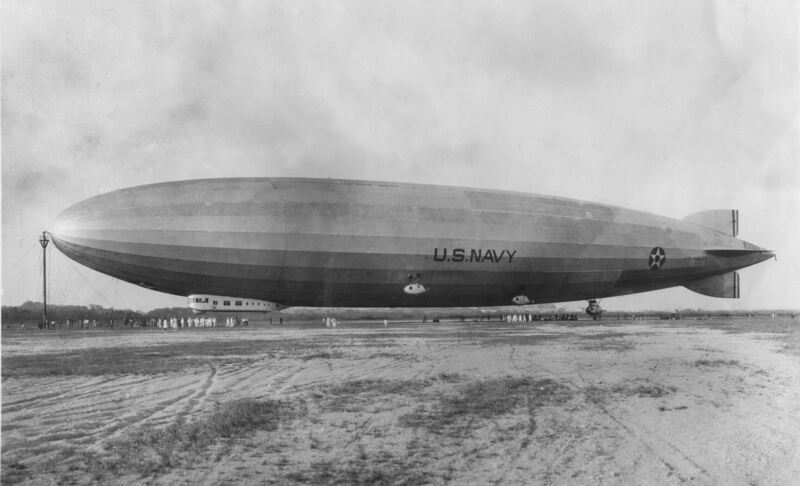 USS Macon was built by the Goodyear-Zeppelin Corporation at Akron, Ohio. It was launched 21 April 1933, and commissioned 23 June 1933. Macon was constructed of duralumin ring frames and girders, covered with a fabric envelope. 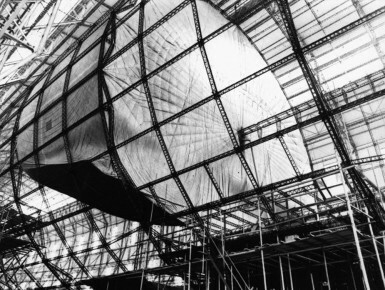 The rigid airship was 785 feet (239.3 meters) long with a maximum diameter of 132 feet, 10 inches (40.488 meters). The overall height was 146 feet, 2 inches (44.552 meters). 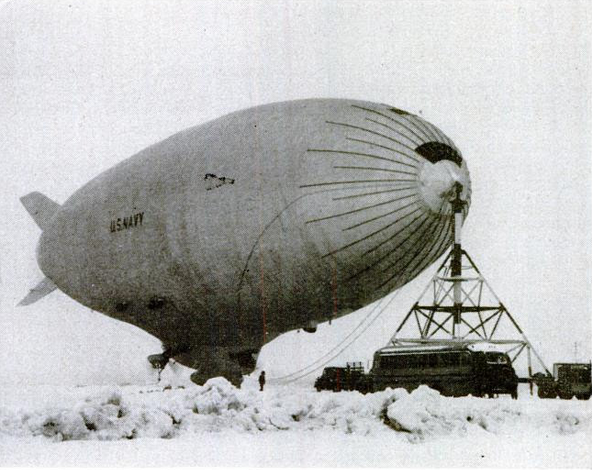 The airship displaced 7,401,260 cubic feet of air (209,580 cubic meters). Lift was provided by 6,500,000 cubic feet (184,060 cubic meters) of non-flammable helium gas contained in 12 rubberized fabric gas cells. Macon had a dead weight of 108.2 tons (98,157 kilograms) and a useful lift of 160,644 pounds (72,867 kilograms). 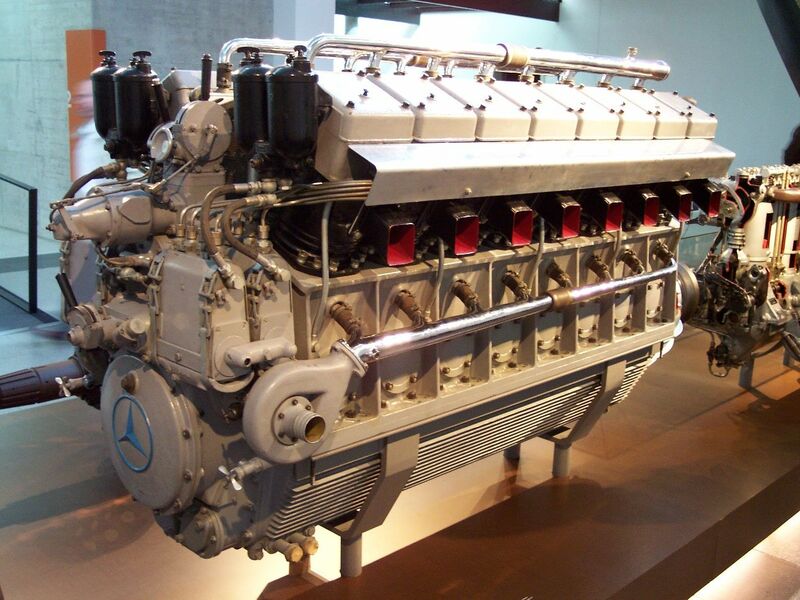 Propulsion was provided by eight water-cooled, fuel-injected, 33.251 liter (2,029.077-cubic-inch-displacement) Maybach Motorenbau GmbH VL-2 overhead valve 60° V-12 gasoline engines producing a maximum 570 horsepower at 1,600 r.p.m., each, or 450 horsepower at 1,400 r.p.m. for cruise. In addition to gasoline, the VL-2 could also use blau gas (similar to propane) as fuel. The engines were reversible and drove Allison Engineering Co. out-drives, which turned three-bladed, fixed-pitch, rotatable propellers. The VL-2 is 6 feet, 5 inches (1.96 meters) long, 3 feet, 0 inches (0.91 meters) wide and 3 feet, 2 inches (0.97 meters) high. It weighs 2,530 pounds (1,148 kilograms). 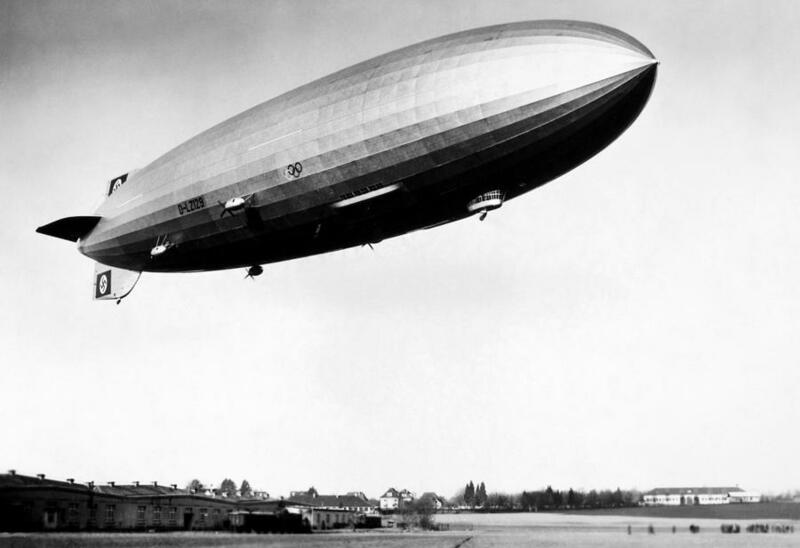 The airship had a maximum speed of 75.6 knots (87.0 miles per hour/140.0 kilometers per hour). USS Macon was armed with eight Browning .30-caliber machine guns for defense. 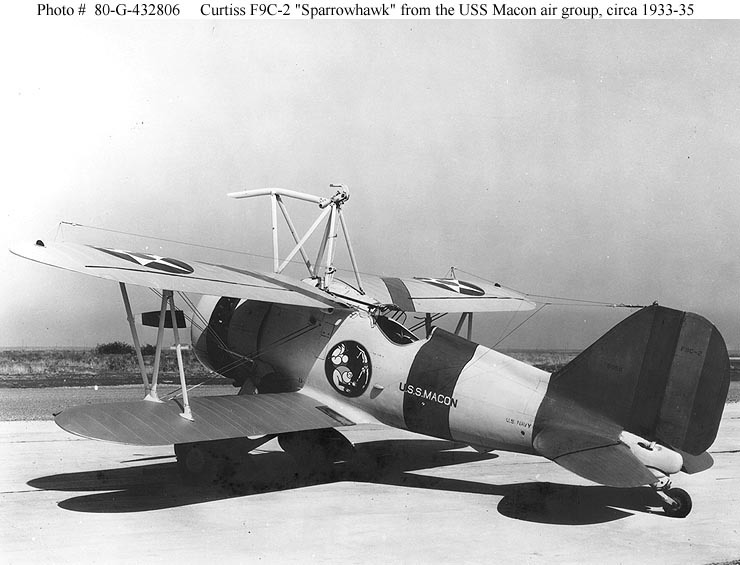 It also carried five Curtiss-Wright Airplane Division F9C-2 Sparrowhawk reconnaissance airplanes in an internal hangar bay. 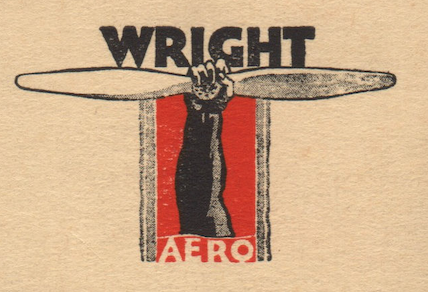 These were small single-place, single-engine biplanes, with a length of 20 feet, 7 inches (6.274 meters) and wingspan of 25 feet, 5 inches (7.747 meters). The Sparrowhawk had an empty weight of 2,114 pounds (959 kilograms) and loaded weight of 2,776 pounds (1,259 kilograms). 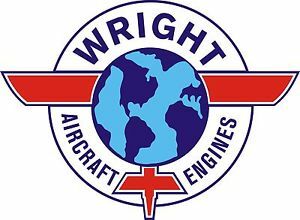 The F9C-2 was powered by an air-cooled, supercharged, 971.930-cubic-inch displacement (15.927 liter) Wright Aeronautical Division Whirlwind R-975E-3 (R-975-11, -24 or -26) nine-cylinder radial engine with a compression ratio of 6.3:1. The R-975E-3 had a normal power rating of 420 horsepower at 2,200 r.p.m., and 440 to 450 horsepower at 2,250 r.p.m. for takeoff, depending on variant. These were direct drive engines which turned two-bladed propellers. They were 3 feet, 7.00 inches to 3 feet, 7.47 inches (1.092–1.104 meters) long, 3 feet, 11 inches to 3 feet, 11.25 inches (1.143–1.149 meters) in diameter, and weighed from 660 to 700 pounds (299–317.5 kilograms). The Sparrowhawk had a maximum speed of 176 miles per hour (283 kilometers per hour), a range of 297 miles (478 kilometers) and a service ceiling of 19,200 feet (5,852 meters). The airplane was armed with two fixed Browning .30-caliber machine guns, synchronized to fire forward through the propeller arc. Four of Macon‘s fighters, Bureau of Aeronautics serial numbers A9058–A9061, were lost when the airship went down. Herbert Victor Wiley was born at Wheeling, Missouri, 16 May 1891. He was the second of three children of Joel Augustine Wiley, a dry goods merchant, and Minnie Alice Carey Wiley. 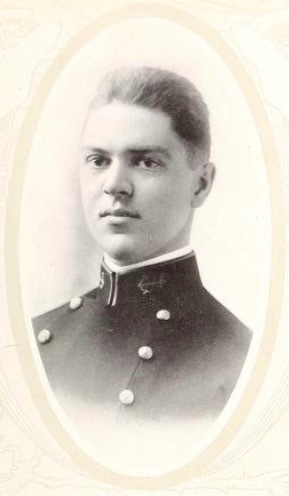 Herbert Victor Wiley entered the United States Naval Academy at Annapolis, Maryland, as a midshipman, 10 May 1911. During his third year, Midshipman Wiley served aboard the battleship USS Wisconsin (BB-9). “Doc” Wiley graduated 5 June 1915 and was commissioned an ensign, United States Navy. Ensign Wiley was assigned to the Pennsylvania-class armored cruiser USS San Diego (ACR-6), then the flagship of the U.S. Pacific Fleet. Ensign Wiley was promoted to the rank of lieutenant (junior grade), effective 15 October 1917. On this same date, Wiley was promoted to the temporary rank of lieutenant. 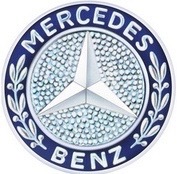 This rank became permanent 1 July 1920. Lieutenant Wiley married Miss Marie Frances Scroggie, circa 1919. They would have two sons, Gordon Scroggie Wiley and David Carey Wiley. Mrs Wiley died 17 September 1930 in Los Angeles County, California. On 11 April 1923, Lieutenant Wiley was assigned to the Naval Air Station, Lakehurst, New Jersey. He served aboard the U.S. Navy’s first rigid airship, USS Shenandoah (ZR-1), and was aboard on its first flight, 4 September 1923. A year later, as Shenandoah‘s mooring officer, Wiley was standing by at Lakehurst, New Jersey, when, on 3 September 1925, the airship was destroyed during a violent storm. Of its 40-man crew, 14 were killed. Lieutenant Wiley was then assigned to the dirigible USS Los Angeles (ZR-3), 19 January 1925. 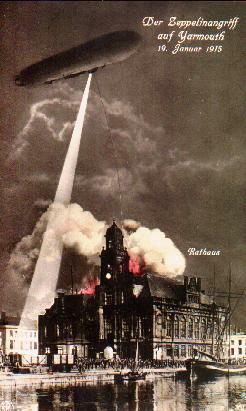 (Los Angeles was built by Luftschiffbau Zeppelin GmbH, and designated LZ-126. It was commissioned in the U.S. Navy in 1924.) Wiley was promoted to lieutenant commander 17 December 1925 and transferred to NAS Pensacola, Florida. In 1928, Lieutenant Commander Wiley served as the executive officer of Los Angeles. 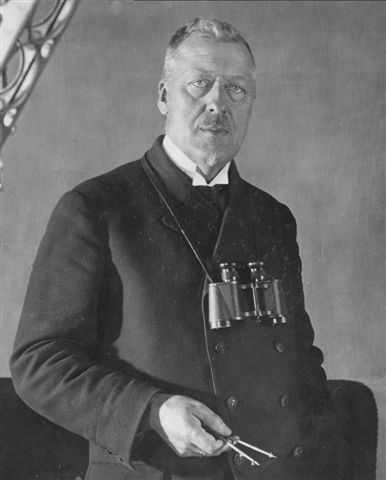 He commanded the airship, April 1929–April 1930. Lieutenant Commander Wiley was the executive officer of USS Akron (ZRS-4) when it was destroyed in a storm off the coast of New Jersey, 4 April 1933. 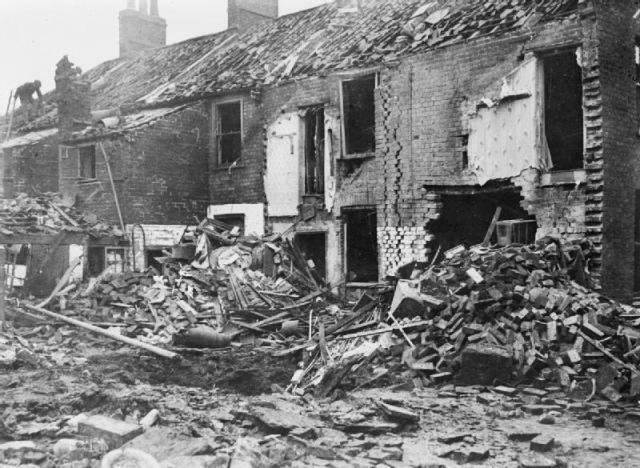 Of the crew of 76 men, only 3, including Wiley, survived. 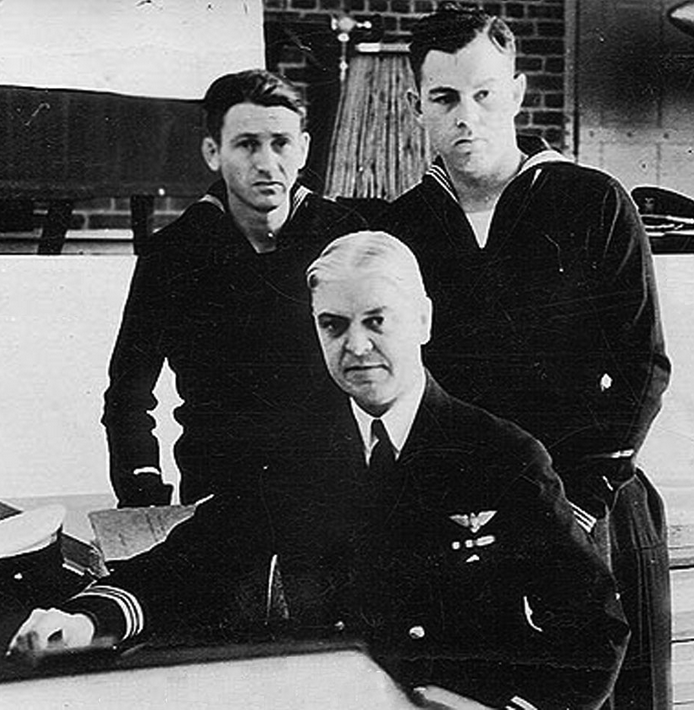 Wiley took command of USS Macon 11 July 1934. On 23 September 1935, Lieutenant Commander Wiley married Mrs. Charlotte Mayfield Weeden (née Charlotte May Mayfield) in Los Angeles County, California. Lieutenant Commander Wiley was promoted to the rank of commander 1 November 1935. 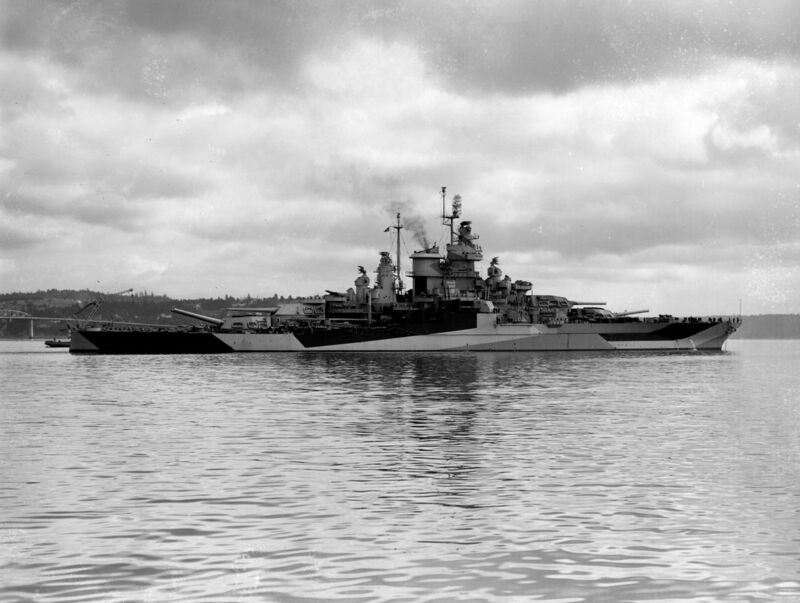 He was assigned to the battleship USS Mississippi (BB-41). In 1938, he transferred to the U.S. Naval Academy. Commander Wiley was promoted to the rank of captain, with date of rank from 1 July 1941. During World War II, Captain Wiley commanded Destroyer Squadron 29 (consisting of thirteen Clemson-class “flush-deck” destroyers) with the Asiatic Fleet. 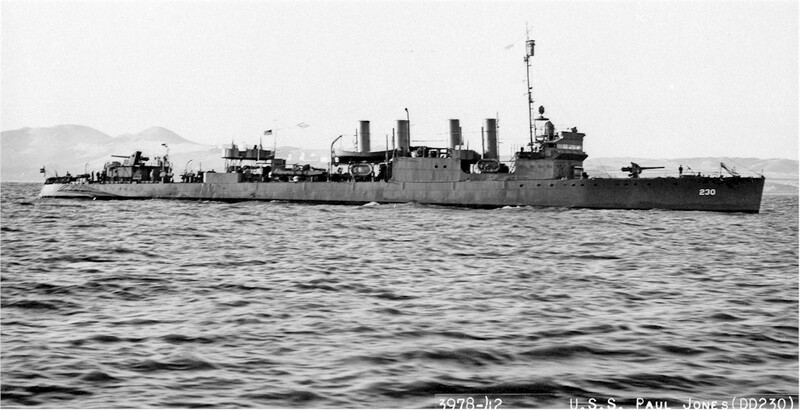 His flagship was USS Paul Jones (DD-230). 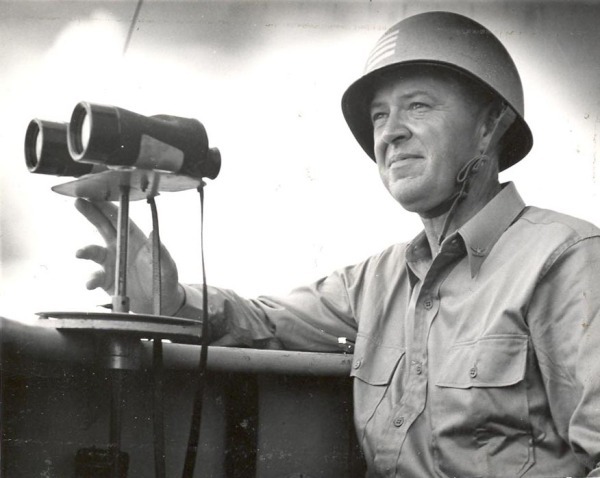 During the Battle of Okinawa, Captain Wiley remained on the bridge of his battleship for thirty consecutive days. During this period, West Virginia was hit by a kamikaze suicide attack. Captain Wiley served as West Virginia‘s commanding officer until 2 May 1945. Captain Wiley was promoted to the rank of rear admiral, and commanded a naval aviation facility on the island of Trinidad. While there, he suffered a heart attack. He retired from the U.S. Navy on 1 January 1947, after nearly 36 years of service. Following his naval career, Admiral Wiley was the dean of the School of Engineering at the University of California, Berkeley. 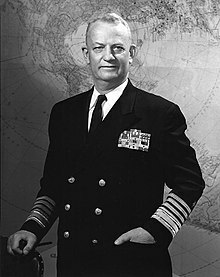 Rear Admiral Herbert Victor Wiley, United States Navy, died at Pasadena, California, 28 April 1954. He was buried at the Golden Gate National Cemetery. ¹ The Battle of the Surigao Strait was a major naval engagement between surface forces of the Imperial Japanese Navy and the United States Navy, a part of the larger Battle of Leyte Gulf. It was the last battleship vs. battleship naval battle. History of United States Naval Operations in World War II, Volume XII, Leyte, June 1944–January 1945, by Rear Admiral Samuel Eliot Morison, United States Navy. 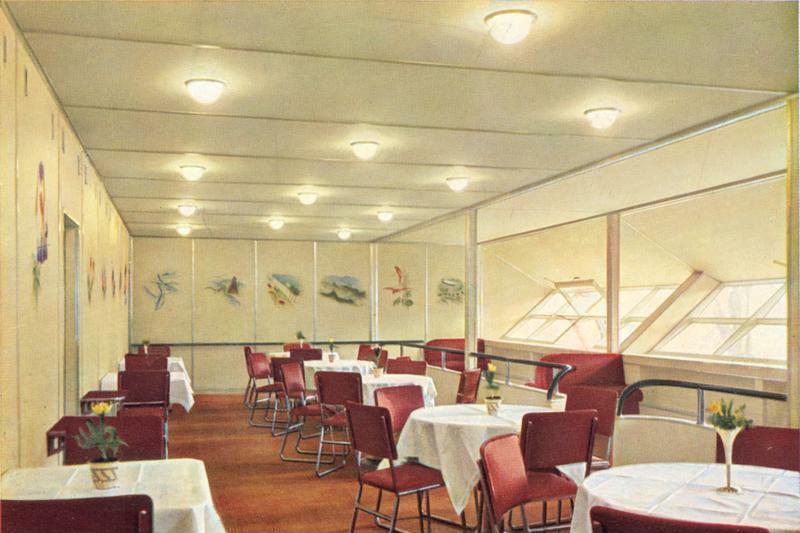 Little, Brown and Company, Boston, 1958. The Battle of Leyte Gulf 23–26 October 1944, by Lieutenant Commander Thomas Joshua Cutler, United States Navy. HarperCollins Publishers, Inc., New York, 1994.